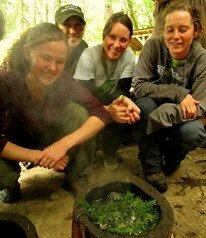 Primitive fire making with flint and steel can be a very powerful experience. Once you have mastered the process, you become one of the few people who can build a fire without the use of matches, bringing you much closer to our ancestors. Creating char cloth is the process of burning 100% cotton fabric without oxygen. 100% cotton must be used, as fabric with any trace of synthetic material will not char properly. Old, worn out, cotton t-shirts are a great source of cotton for char cloth. To create char cloth, first you must prepare a small metal tin (about the size of a mint tin) by punching a 1/16" hole in the lid with a small nail. Then place the tin onto hot coals to burn off any impurities and paint. After the tin is thoroughly cooked, carefully remove it from the heat and allow it to cool. Cut your cotton into pieces approximately 2" by 3" and loosely place eight to ten pieces into the tin. Closing the lid tightly, place the tin once more onto hot coals. Change the position of the tin a couple times to encourage even burning. During this process you will soon notice a plume of smoke and then a small flame coming out of the nail hole in the lid. Continuing watching until the flame goes out and the smoke decrease to a small whiff. At this point remove the tin from the coals. Do not open the tin until it is completely cooled (approximately 5 minutes). Opening the lid too soon may cause the cloth to burn up. After the tin has cooled sufficiently, carefully open it to examine your char cloth. The finished product should be uniformly coal black and somewhat fragile. Fabric showing any brown is not completely burned. If this happens, repeat the process. Your tinder will need to be roughed up to make it as thin a fiber as possible. Don't waste any of the loose fibers that fall away during this process. Save these to add to the bird nest-shaped bundle later. This is another key to primitive fire making. Take the fine, roughed-up, twisted tinder materials and place them together to form a loose bird's nest shape, approximately 4" in diameter. Into the center of this nest pour all the loose small particles of tinder that you saved while roughing up the material. Set this aside, keeping it as dry as possible. For a right handed person, you now take a small piece of steel in your right hand. This is referred to as a striker. Then you place a small chunk of flint in your left hand with a piece of char cloth lying across the top of the flint stone. While holding your left hand about waist height, tip a sharp edge of the stone up at a slight angle. Strike the steel striker against the flint edge with a forceful downward glancing motion. As the steel strikes the stone, sparks will fly. Watch the cloth carefully at this point. When a spark lands on the char cloth it will begin to glow red! Place the glowing char cloth into the center of the bird's nest tinder bundle. Using cupped hands gently close the nest up around the glowing cloth. While holding the bird's nest up in front of you (at nose level) begin gently blowing on the glowing ember. When the tinder begins to smoke, blow harder until the tinder bursts into flame. Carefully place the burning nest into the center of the wood in your fire pit (which is preferably stacked into a tipi shape) and continue gently blowing until the fire catches. CONGRATULATIONS - You've succeeded at primitive fire making with flint and steel! Hawkeye has developed the ultimate, complete Flint and Steel Fire Making Kit! 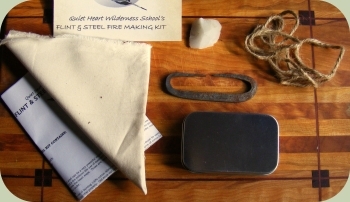 You can visit Quiet Heart Wilderness School's website to inquire about purchasing one of Hawkeye's Flint and Steel Primitive Fire Making Kits! About the Author: Allan Sande taught wilderness skills for over twenty years. He founded Quiet Heart Wilderness School and was an adjunct teacher at Alderleaf. Learn more about Allan Sande.